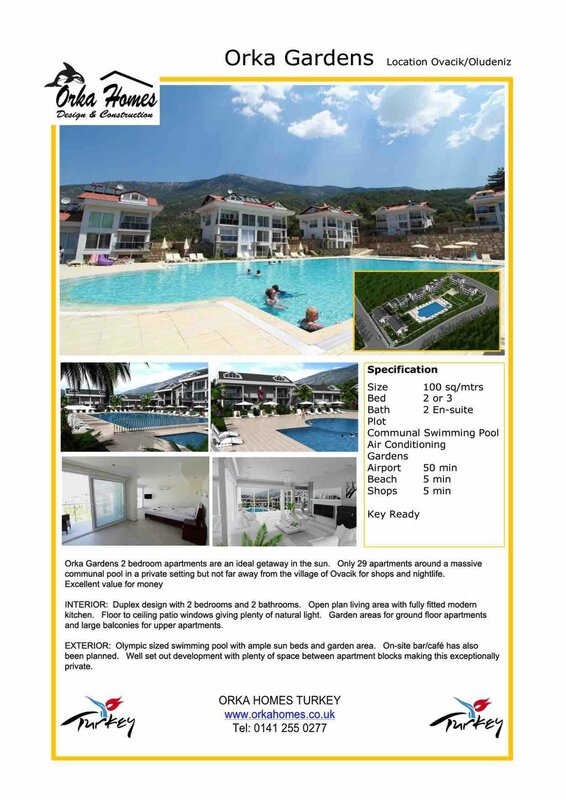 Orka Gardens Ovacik apartments for sale consist of 29 luxurious 2 bedroom duplex apartments each with fabulous pool and mountain views. The complex has a very large swimming pool, landscaped gardens and large balconies which will enable you to enjoy the peaceful surroundings and stunning scenery in this tranquil setting which is nestled in the village of Ovacik. The local shops, bars and restaurants are just a short walk away. The apartments are built over two levels with your choice of garden or penthouse. each apartment has the lounge / kitchen / dining area on the ground floor and the bedrooms on the upper floor. The ground floor apartments have a small private garden area. The apartments are very spacious and light and the development is very private and with its own childrens pool as well. The apartments are within easy walking distance of all the local bars, shops and restaurants if required but the location gives you peace and tranquility as well for sunbathing.